SEWARD, Alaska — For a second year, members of the Coast Guard Research and Development Center, based in New London, Connecticut, make their way to the large ice floes of the Arctic Ocean to conduct research and test new equipment and technologies with the aim of expanding our knowledge and enhancing our ability to respond to potential hazards and emergencies brought on by increased vessel traffic through the region. It’s a mission as big and as important as the Arctic itself and one they couldn’t do alone. 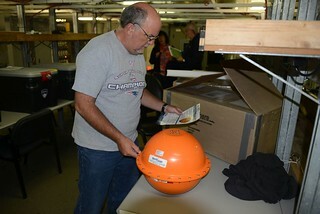 ike Coleman, an engineer from the Coast Guard Research and Development Center in Groton, Conn., examines a tracking buoy aboard the Coast Guard Cutter Healy in Seward, Alaska, Aug. 7, 2014. U.S. Coast Guard photo by Petty Officer 1st Class Shawn Eggert. When RDC members depart for the Arctic, they do so aboard the Coast Guard Cutter Healy, a 420-foot icebreaker homeported in Seattle, Wash., that serves as a perfect platform for conducting Arctic research. The Healy’s expert crew knows its way around, and sometimes through, the ever-shifting ice floes of the north, and their nautical skills and experience on the sea are vital to the success of the RDC’s mission. Also along for the journey or assisting from afar are 14 additional agencies and universities including the National Oceanic and Atmospheric Administration, US NORTHCOM, US Space and Naval Warfare Systems Command,U.S. Army Corps of Engineers Cold Region Research and Engineering Laboratory, and University of Cambridge. 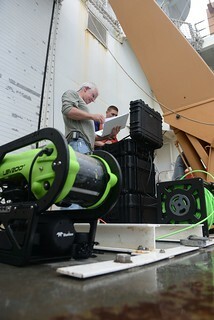 Barry Hurst, a physical education instructor from the Coast Guard Academy in New London, Conn., and 1st Class Cadet Gabriel Patterson, prepare to test a submersible remote operated vehicle aboard the Coast Guard Cutter Healy in Seward, Alaska, Aug. 7, 2014. U.S. Coast Guard photo by Petty Officer 1st Class Shawn Eggert. Among those participating in the RDC’s Arctic mission for the first time is the Department of Homeland Security’s Science, Technology Engineering and Mathematics program intern, an internship designed to complement the studies of students pursuing careers in STEM-related fields. Extending an offer to include a DHS STEM intern not only gives the student a chance to work alongside professional researchers, but it can also offer the mission a fresh perspective. The RDC members and their partners will test and study a wide range of technologies during their trip to the Arctic including unmanned aerial and submersible vehicles, information management systems, and tracking buoys, which can be used to monitor chemical spills. These devices could prove invaluable to future research or in the event of a maritime disaster on Alaska’s north coast. “One of our goals as part of Arctic Shield 2014 is to broaden the Coast Guard’s partnerships with Alaskan communities, especially along the North Slope,” said Hansen. “With that in mind, the RDC coordinated with Alaska’s state government and tribal communities and invited representatives to travel with us and observe our research.” A member of the State of Alaska’s Department of Environmental Conservation is riding with the team. As Arctic ice recedes, the Coast Guard’s area of responsibility expands. New avenues for maritime traffic will bring new challenges, but what the RDC and its partners discover during their summer sojourn may better prepare them for what lies ahead.